Constructed with 100% thermally fused laminate for durability and superior resistance to scratches and stains. All file drawers accommodate letter, legal and A4 size files. Lockable Drawers feature full-extension ball-bearing slides. Anti-tip safety mechanism included. Accepts lateral file hutch. Aluminum drawer hardware and edge detail. Ships fully assembled. Designed for small to medium home offices, the Enterprise Collection 30W 2-Drawer Lateral File for a transitional styling that creates a professional impression anywhere. Each component is constructed with 100% thermally fused laminate for durability and superior resistance to scratches and stains. The 2-Drawer Lateral File provides an anti-tip safety mechanism and enables the addition of our 36W Lateral File Hutch for an integrated storage solution that extends into a creative wall unit. This 2-Drawer Lateral File features a durable PVC edge banding and is built to desk height, forming a level work area that lines up with all of your Enterprise office furniture. 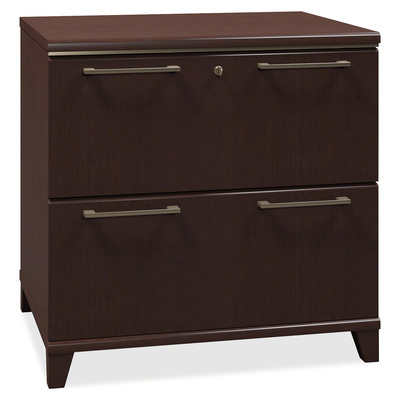 File drawers accommodate all legal, letter and A4 file sizes and utilize full-extension ball-bearing suspension. Our front facing lock in upper drawer secures the file drawers, plus offers full-extension slides and ball-bearing suspension for easy access and years of dependable use. Rely upon a quick installation with pre-assembled components, cases and pedestals. Enjoy our modular casegood collection in the right scale and transitional style for tight spaces in your home or office.